With the toolbox Point of Return has given me, I have faith that I can remain medication-free. I am very grateful! We have helped people in 76 countries and every state of the United States. Read their testimonials. Benzo dependence is by far the most challenging addiction, and modalities applied to other types of addiction cannot be used for benzo withdrawal. Taper rates are slower than other classifications so the 45 million GABA receptors have adequate time to readjust between tapers. Symptoms must be managed or even a gradual taper is too challenging for most to overcome. Simple vitamins, herbs and over-the-counter items can increase symptoms, including Calcium supplements, B-Complex, Valerian, and over-the-counter items including synthetic melatonin or sleep aids. Knowing what to use and what to eliminate is essential to your success. We know the notion of escaping benzodiazepine addiction seems overwhelming and unattainable. Its not, you can heal and actually sleep again. You can engage fully in life and feel in your skin, laugh and find pleasure in life. You can do it - Let us help you escape this horrible addiction... We establish slow taper rates and use with all-natural items to calm your system throughout the process, and nothing will interact with your medications. And of course our compassionate, kind and skilled team ensures you make back to life as we all have. 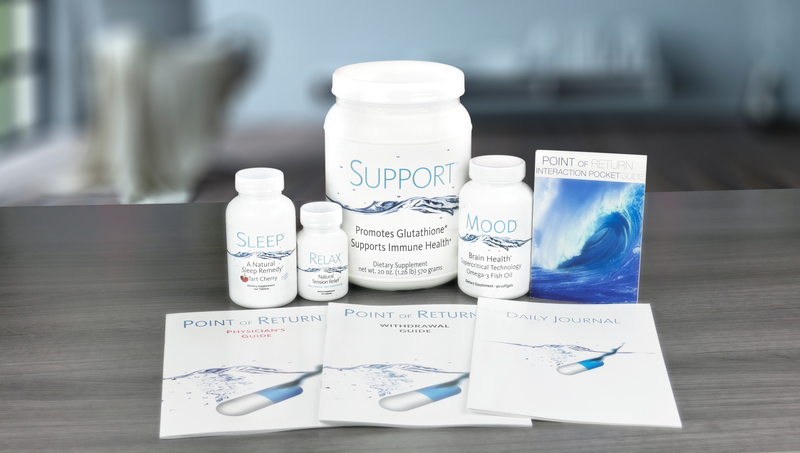 Point of Return is an At-Home program to escape benzodiazepine dependence. It’s a collaborative effort between Point of Return, You, Your Doctor and Pharmacist.